The next ICDs reviewed are for genetically based syndromes or diseases, which are almost immediately diagnosed but tend to progress in life. Some of these condition are late diagnoses due to the manner in which the symptomatology presents clinically. It is important to note here that there are a variety causes for pyramids to be generated in some particular form. The attempts made here are to retain objectivity with the evaluations of these results presented, with a little subjectivity added in to disguise the true causes for the conditions illustrated. Suffice it to say that this method had been run on hundreds of conditions enabling some of these differentiations to be developed, but not revealed too much right now due to IP related topics. For the above two hypothetical pyramids related to genetic disease, the condition on the left is fatal and the one on the right is not. Both have an onset soon after birth, with the initial diagnosis rapidly made as soon as the first symptoms are found due to regular well-care visits. Both conditions express their severity symptomatically soon into their victims’ life experience. But the major difference between the two is that the first begins to demonstrate this fatality once its sufferers reach the age of 35 to 40; by 50, a large number of those carrying this disease have died. The second disease demonstrates some fatality by the time the victims reach 2o years of age, but this is minimal and others carrying the disease managed to continue to live productive lives well past the 50 year old mark, some even into their 90s. This disease is a condition that results in morbidity, not mortality, and it is up the health care systems available to keep these costs at a minimum. One other feature of the first disease that does in fact truly exist with some genetic diseases is demonstrate by the asymmtery of the mal and female distribution curves. The females manage to survive with the condition well into and throughout their reproductive years. In fact, being that the above figures represent incidence/prevalence rates in 1-year increments, not total numbers of cases, it is important to note that there are twice as many females alive with the disease as there are males, which is not the case for the second malady. This means the first disease is more likely to be passed on during the reproductive years than the second disease given the right circumstances and quality of life related problems. This latter point is extremely controversial, and can have the effect of causing a considerable amount of rebelliousness on behalf of clinicians and researchers when it comes to using population pyramids as the means to evaluate disease natural history as a sociological phenomenon. In other words, this way of interpreting population pyramids for ICDs is very neo-darwinian in nature and has some methods of interpretation and sociological reaction that are reminiscent of the eugenics popular from the 1920s (when it was an American scientist’s endeavor) to the 1940s/1950s (the consequence of its misapplication thereby leading up to WW II). The development of a disease pyramid, from prevalence calculated from a small number of patients (1/100,000) to a large number of patients (1/1000). All three have moderate to high fatality for individuals <65 yo. There are several features here with genetic diseases that are possibly tied to natural events, normally not evidenced by past work methodologies. Nature has its (her) way of varying events over time as if in some sort of step-wise, undulating manner, which is what these three conditions demonstrate. This genetic shift concept is a well defined in phenomenon in nature, and is a situation in which a particular trait moves around a population rather than stay within just one narrow band of subsets that are narrowly defined genetically. It may be the disease itself and its genetic requirements that is responsible for this, or it is due to population fluctuations seen at the gender level. This can also be a side effect of the methodology I employed for evaluating the data that could be the cause for these undulations. 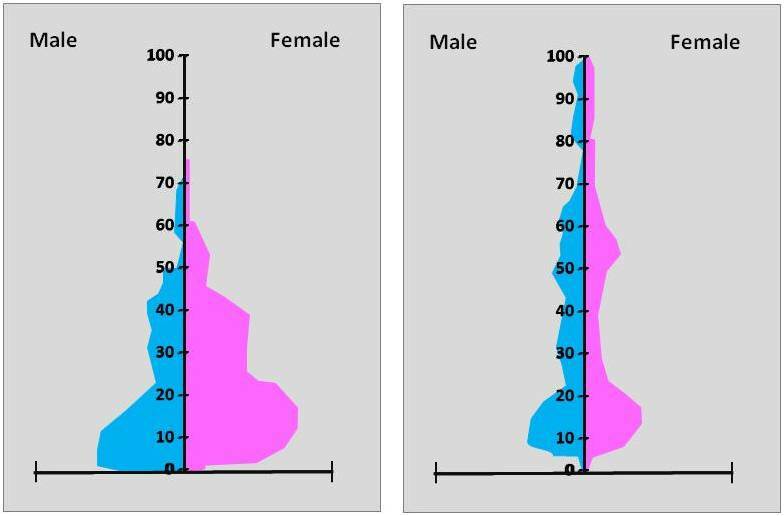 The undulations from one gender to to the next are seen with the first scenario to the left, for ages 12 to 45. In the first graphed example, this could be due to artificial peaks displayed at 2, M, 8 (F), 12 (M), 22 (F), 27 (M), and 35 (F). The second peak shows some smoothening of these peaks, even though they are much greater in number (this disease is rarely according to x-axis figures, but more evenly dispersed in terms of 1-year age brackets according to the figure.) The third peak represents the smoothening out of the curve once large enough numbers of people are graphed and evaluated using the formulas that were developed. In the above figure this behavior makes the first two peaks interesting but not necessarily something reportable with much certainty and reliability. The third however is very reliable, and demonstrates important age peaks for the condition for separate age brackets, male versus female. 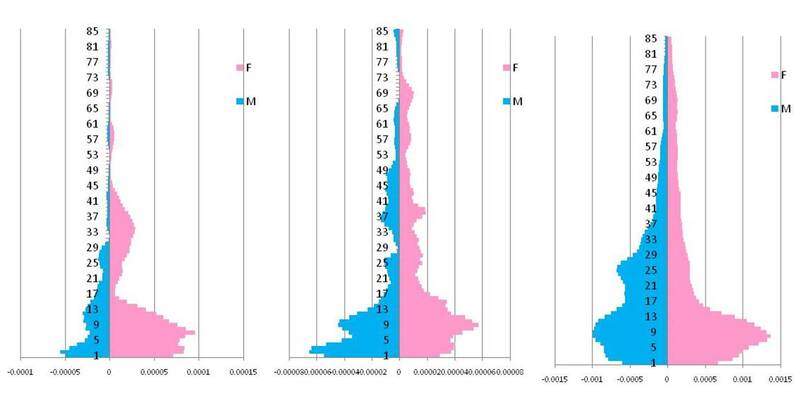 If this third peak represented a physiologically-linked genetic disorder, we would see considerable gender specificity for the 21-28 year old age group in the clinical setting. This suggests that something happening with males is creating an increased incidence in the male population. One the other hand, sociocultural settings and the behaviors linked specifically to men may also be impacting how and why this peak is formed. For diseases or condition in which social and cultural setting place an important role in how the patient suffers and how the people treat him/her, and this condition or disease is of a psychological or mental health nature, this demonstrates an interesting interplay beween individuals, society, the medical system in general, and how a disease is proocessed and develops in someone. Such would an interesting topics to follow up on and then report. Also note in the third graph above that like many diseases that exist there are gender-specific age-linked prevalence outcomes. There is a much larger peak for younger women than there for the mid-age large peak for men. This suggests that women could be biologically different once menses begins, again also suggesting there is this sociocultural caused age-gender relationship at least in part, that could be related to the medical problem is at hand. The larger peak in women in mid-childhood years could also be due to selective examination of potential victims of this condition-meaning women are more likely to undergo visit-related care and pharmacological treatment than men, until the men reach 23 years of age, then they outnumber to women in the medical books. In the above, the conditions progress from left to right as extremely rare to moderately rare. These syndromes are mostly recognized from birth on, and tend to manifest themselves in females at one stage in life and males in two or three others. The rarest conditions tend to be more fatal, but this might also be a result of its overall scarcity as well. The first, Spinal Bifida, is commonly believed to be a result of vitamin deficiency (B12) during the fetal development years. The severity of this condition determines the longevity of its victims, and their overall life experience. Since prevalence is decreasing as age increases, it is assumed that primarily this is due to the mortality of the severe cases. Spinal Bifiida is not necessarily a condition where we expect the number of people with such an ICD-claim to decrease due to lack of visits, however, the reason for the visit possibly lessens over time thereby reducing the number of ICD entries for spinal bifida as people get older. Comparison Chromosomal Disorders with Von Willebrand Factor, a genetic coagulation disorder, we see a unique gender behavior for the latter, with large numbers of cliams in the childhood age due to ICDs recorded for diagnostic visits along with actual treatment and diagnotics confirmation visits. 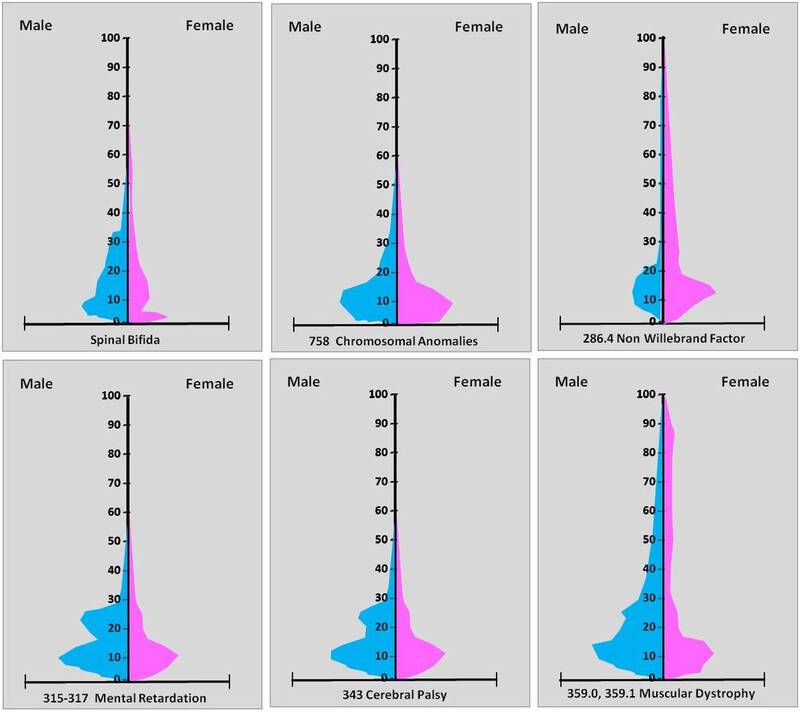 The shared bimodal feature on the male side of the curves for mental retardation and cerebral palsy demonstrate how social and cultural are possibly impacting the diagnoses and numbers of people with each of these claims. The younger age peak is expected, and is a result of the diagnostics process. The second peak is developed due to the develdhood-early adultholopment of an ICD system that allows for moderate and severe versions of these conditions to be differentiated. With age, more behaviors develop in Mental Retardation cases, and more options are availabe for assigning the older individuals with new ICDs differentiating various levels of severity. This results in the older childhood-young adult peak that is seen, especially for male patients. Since Muscular Dystrophy lacks this ability to greatly differentiate the severity of the illness (mental retardation options range from ICDs 215 to 317, each with increasing severity, versus just two levels for muscular dystrophy), this secondary male peak is smaller in size. 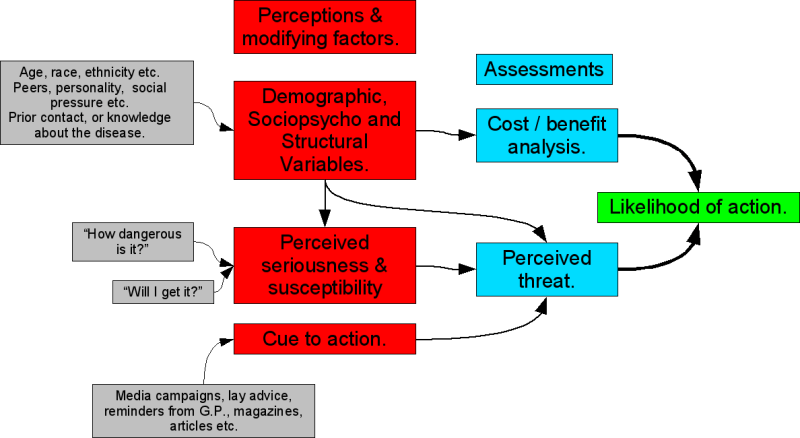 There exist a number of theoretical disease behavior models that are linked to the above scenarios, but the closest model to socially influenced disease patterns is the Health Belief Model (HBM). With HBM, a given individual’s and society’s knowledge, the professionally-based clinicians’ teachings and practice, and the social, family’s and patients responses to these environmental stimuli define the medical practices and ultimately long term outcomes related to a particular disease state or condition. As patients suffereing from a condition, we are victims of the teachings and preachings of others if we are not careful with what we allow ourselves to believe. By doing so we influence the psychosomatic part of whatever disease or condition we have which ultimately can help to define our fate. If the condition or diseases lacks much biological content, such as for many psychological, behavioral ICDs, the means we can define our long term outcomes. But in the case of a very biological disease like those which a genetically and physiologically induced due to the inherent make up of our body, it becomes difficult to prevent fate from happening. Diseases which demonstrate the rapid narrowing of prevalance as age increases perhaps fall into this latter category. This population pyramid form related feature exists for numerous diseases, and is useful in demonstrating when specific ICDs lack this fatalist’s like prediction for certain conditions. This makes population pyramid modeling of ICDs a fairly controversial way of assessing specific disease or condition related outcomes.